Due to the recent spate of blockbuster films featuring the superhero, it seems like the entire world knows about Captain America. However, comic veterans know there are a lot of strange stories about the patriotic Avenger that will never make it to the silver screen. For characters as old as Captain America, it’s a challenge to come up with a foe that Cap has not fought before. Since Cap is such a powerful symbol of America itself, writer Mark Gruenwald came up with a foe new to Cap but very familiar to America: drugs. After Captain America finds out the Avengers’ handyman, Fabian, is tripping hard on some unspecified drug, he insists that Fabian get treatment. Fabian responds with what could have been a one-off joke but instead became a major plot point. He accuses Captain America of being a hypocrite because he owes all of his powers to the super-serum drug. It’s difficult to compare a government-sponsored program to win an important war to illegal drugs like heroin or cocaine, but Captain America fully buys into it after a bizarre storyline where he is exposed to a drug known as “Ice.” He instantly becomes an aggressive jerk and eventually devolves into insanity, calling out a cowardly villain by repeating “bock bock bock bock” over an entire panel. Eventually, Cap is saved when the Avengers perform a complete blood transfusion, which also removes his super-serum. When they find a way to give it back to him, Captain America declines, saying “If I can’t just say no, who can?” It seems insane to put billions of lives at risk because you think all drugs are the same, but fortunately, he didn’t lose his powers for long. Casual Marvel fans who have only watched The Avengers and related movies could be forgiven for assuming that it takes Chris Hemsworth’s arms to lift the mighty hammer Mjolnir. However, as any Thor nerd is happy to point out, picking up the hammer does not require physical strength. The not-so-fine print of the hammer reads “Whosever holds this hammer, if he be worthy, shall possess the power of Thor.” Hence, a number of Marvel characters (along with Superman and Wonder Woman), have held the hammer. During an attack by some of Seth’s followers, Thor is separated from Mjolnir. 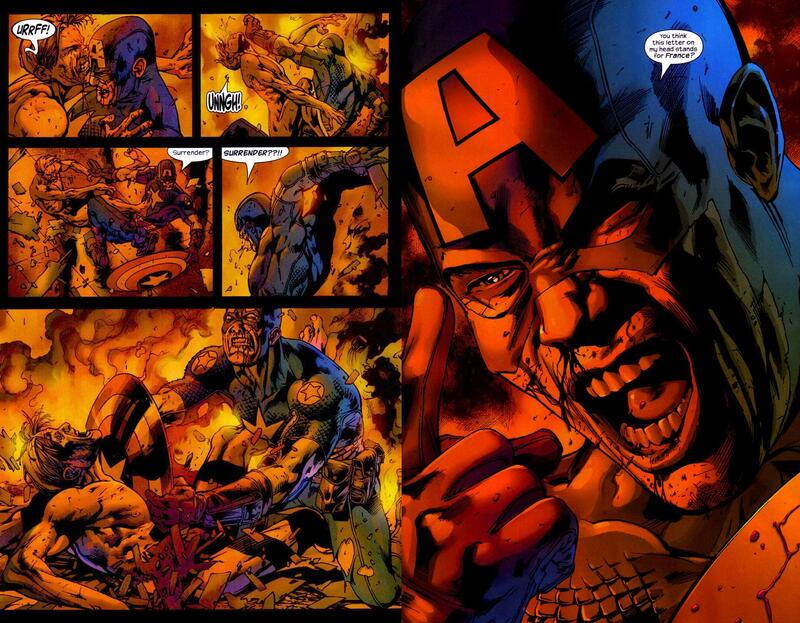 Cap wants to give it back to him, but in the process of reaching for it, he is overpowered by bad guys intending to crush him, so he comes out swinging the hammer and swiftly defeats them. Afterward, Thor congratulates the Captain on having the pure heart and noble mind to use his hammer. The two exchange more pleasantries under the setting sun before parting ways. The idea of heroes turning into werewolves in a Marvel comic is not as far-fetched as you might think. Given that this universe contains all sorts of monsters, it’s more surprising that such transformations don’t happen more often. At any rate, while fighting Nightshade, the self-styled “Queen of the Werewolves,” Captain America is injected with a new serum that turns him into a werewolf. Despite the physical change, Cap is more or less still himself. He escapes Nightshade’s clutches and fights off her followers before stumbling into the two most common coincidences in the Marvel universe: Wolverine inexplicably shows up, and he’s in a berserker rage that gives him an excuse to fight good guys. After Wolverine gashes open Capwolf’s shoulder, the Captain calls on his new animal rage, slashing Wolverine’s eyes and then literally throwing him from their battle. Captain America has often been defined by his enemies. As a literal symbol of America, the country’s enemies shape the character. His most iconic bad guys, of course, are the Nazis he first battled in the ’40s, and readers are constantly reminded of these enemies by the Red Skull. However, after World War II but before the debut of the Cap story we know and love, he spent a lot of time serving as propaganda for Joseph McCarthy’s Communist witch hunts. At this time, Cap held the title “Commie Smasher” and met Communist spies everywhere with either his fists or even weapons like gasoline. This wacky witch hunt only lasted a year, but it posed a problem for Marvel later on, as McCarthyism fell out of favor. In the early ’70s, they simply claimed that the Captain America of the ’50s was not Steven Rogers but a crazy American history professor who was a little too obsessed with the superhero. He had plastic surgery to resemble the Captain and recruited a young man as crazy as he was who looked like Bucky Barnes. They somehow got their hands on some Super Soldier Serum without using “vita rays” to keep them from becoming even more unstable. Marvel’s official story is that these two simply hallucinated all of the Communists they kept seeing, leaving the real Captain America free of any Red Scare hysteria. Captain America has become a very public face for Marvel comics, billed as the “First Avenger” and known as the moral center of Marvel’s universe. The only problem with that is that Marvel didn’t create him. He was actually created by Joe Simon and Jack Kirby, the latter of whom later helped Stan Lee create heroes such as the Fantastic Four, the Incredible Hulk, Thor, and the X-Men. The first Captain America comic debuted in 1940, when many Americans were hungry to enter World War II. As a result, it sold nearly one million copies. This ended up being a double-edged sword for Cap, because the comics became infinitely less popular when the war was over. He didn’t make his Marvel debut until The Avengers No. 4, complete with the now-familiar back story about being frozen in ice. There are as many versions of Captain America as there are different dimensions within the Marvel universe. Some of the most popular storylines were those featured in the Ultimates comics, which served as a modern reboot of the Avengers for new comics readers. As an amusing commentary on America’s attitude toward the country, this was all well and good. However, it painted Cap as a very unsympathetic character. 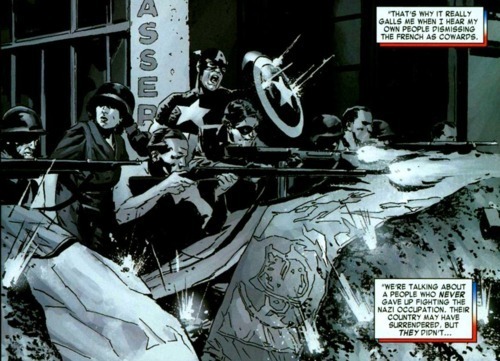 When Ed Brubaker later revived the main storyline through such stories as the original Winter Soldier arc, he had the “real” Cap speak about the bravery of French citizens and the courage it took to keep fighting after your own country has surrendered, knowing that retaliation may come for your entire family. Even casual moviegoers are familiar with the character of Peggy Carter, a tough-as-nails fighter with whom Captain America develops a romantic relationship. She was featured prominently in Captain America: The First Avenger and had a heartbreaking cameo in the sequel as a now-elderly woman suffering from Alzheimer’s disease. Captain America 2 also featured the alluring Agent 13, a blonde S.H.I.E.L.D. agent who poses as Cap’s neighbor and later takes a stand against Hydra infiltration. What is not immediately obvious to moviegoers is the relationship between the two women. In the comics, Agent 13 is Peggy Carter’s niece, Sharon, though she was portrayed earlier as Peggy’s younger sister. While the official explanation for the change was the age difference between the characters, it is likely that even Marvel realized how sleazy it was to involve Captain America with two sisters. After 75 years, it’s easy for a character to become stale. Some writers might keep the storyline fresh by introducing new wrinkles into their backstory or another event that changes how they see the world, but Captain America’s defining features keep him relatively static. As the embodiment of American ideals, he can’t waver from them. Comics scribe Rick Remender instead brought change to Captain America’s environment by transporting him to Dimension Z, where time moves faster. Captain America was only gone from his world for a couple of minutes, but it felt like 12 years to him. During that time, he raised a foster child named Ian, fought Red Skull’s henchman Arnim Zola, and thought that he lost both Sharon Carter and the foster child. Red Skull has always been more intriguing as a symbol than a villain for Captain America. The apparent embodiment of death made a great Nazi icon, but if you discount the times he’s inhabited other bodies (such as a clone of Captain America and an android body designed by Arnim Zola), he has no real powers aside from a quick mind and decent reflexes. However, in the Uncanny Avengers comic, a Red Skull clone goes to grisly lengths to change this fact. He bizarrely decides that mutants must be exterminated for humanity to thrive, so he digs up the body of Charles Xavier (killed by a Dark Phoenix–possessed Cyclops) and grafts parts of the mutant telepath’s brain onto his own. Skull uses his new powers to incite mass rioting against mutants and even overcome Captain America’s formidable will before he is stopped by the Avengers. The reasoning behind Captain America’s survival of World War II makes sense in terms of comic book logic: He is frozen in the ice-cold waters and revived decades later. What is not immediately clear is just how many of Captain America’s World War II pals survived to present day. Nick Fury, for instance, is the same character that originally led the Howling Commandos in the comics, kept alive by regular doses of the infinity formula. This is also what keeps Dum Dum Dugan alive well into the 21st century. The Black Widow received mind and body modifications in Russia’s Red Room that help her defeat Hitler and present-day bad guys. Bucky, of course, survives as the Winter Soldier, though in the comics, he is saved by a combination of his own ice-cold water plunge and Russian suspended animation. This is different from what happens in the film adaptations, where it is seemingly only Arnim Zola’s genetic tinkering that keeps him alive. Arnim Zola himself lives on as a brain inside a walking computer monitor, and Red Skull has been cloned, transferred bodies, and endured his own stint in suspended animation. Each case seems to make some semblance of sense, but taken altogether, it’s amazing that so many characters in the Captain America universe have been fighting the same battles since the early 1940s. Smash commies with Chris @PocketEpiphany.